For over 30 years, we have focused our efforts on being the premiere law firm public relations firm in the country. We have been solidifying and enhancing the credibility of law firms and their attorneys by getting them featured in newspapers and magazines (online and traditional), interviewed as guest experts on TV and radio (local, national and international), and in leading industry publications, blogs and social media outlets. From major court decisions to legislative and regulatory changes, we get our attorney clients to the news media quickly and often with compelling comments and useful takeaways for their target audience. They become the “go-to” leaders in their respective industries and legal practices. Make no mistake… we are not your typical law firm public relations firm. For over a decade, we have focused solely on getting law firms and their partners in major news media markets every day. Our goal is simple, but important to our clients: to generate quality national/international and industry media exposure for key law partners by positioning them to the media as the experts they are. We consistently generate results due to our strong news instincts, relationships with the media, and agility. As a specialty law firm public relations firm, the media know what to expect from us and our clients. Reporters and producers trust and respect us to meet their rapid, real-time deadlines with quality legal experts and they use our sources on a weekly basis. The media knows they can rely on us to provide them with smart, articulate, media-trained attorneys, who can talk intelligently and insightfully about the newsworthy and timely legal issues of the day. Studies show that news media exposure plays a key part in client development for attorneys and law firms. Attorneys that are quoted in the news elevate their credibility, which pays off time and again. 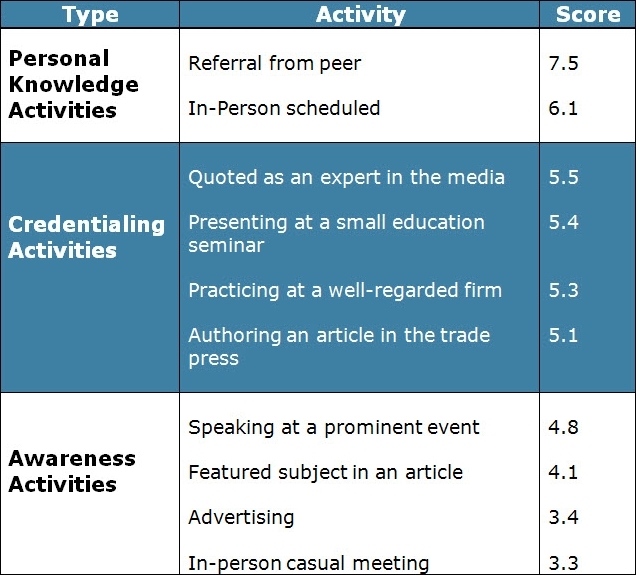 In fact, just 3 positive media mentions are equivalent to a personal referral in terms of trust. When C-level executives are searching for legal expertise, advertising and networking play much less of a role in their decision-making then media visibility and referrals. We help attorneys and their firms become the “go to” experts for high stakes litigation and counseling for a myriad of corporate legal issues. There isn’t an area of law firm practice specialty we have not supported and our relations with national and international business, financial, and legal media are well-rounded and deep. As a highly focused law firm public relations firm, the practice areas we have worked in extensively include: regulatory, corporate finance, banking, labor and employment, intellectual property, litigation, construction and real estate, legislative, cyber-security, privacy energy and environment, food and agriculture, international trade, privacy, telecommunications, international litigation and arbitration, to name a few. Working as a niche, specialty law firm public relations firm, we utilize a unique “press secretary” model that focuses on garnering solid news media coverage to underscore attorneys’ expertise in industry and practice areas. Our clients are quoted weekly in print, radio and TV in leading publications such as the Wall Street Journal, New York Times, National Law Journal, CNN, Fox News, NPR, Associated Press, Bloomberg and many, many others. We utilize a multi-pronged approach that not only earns media coverage for attorneys in their backyard, but nationally, internationally and in their priority industry publications. In addition, we work with our clients to ensure their attorneys stay on top of awards and activities in their communities and we have a 98% consistent rate in getting them published in key publications for their client development. We understand the needs of internal MarCom and business development departments in law firms and often work as an extension to firms that already have PR representation. We support law firm MarCom teams seamlessly to amplify and build on their efforts by obtaining earned news media exposure to help reach targeted marketing and firm goals. Partners and their marketing staff will be able to exploit the enhanced exposure to influence potential client groups. Amplify case victories, positive pro bono outcomes, and successful transactions when it makes sense. As a public relations firm specializing in law firm pr, we are unique because we are quick and agile, knowing who to go to in a moment’s notice, and how to get in front of, and gain interest from reporters, producers and editors in key publications. We give the media exactly what they need… experts who can talk immediately about the issues of the day, in a succinct, compelling, and intelligent manner. And because we act quickly, and can get our clients to do the same, the media are more inclined to interview our clients. We’re small, but well-connected. We have broad and deep relationships with print and broadcast media at every level — from 20,000 circulation weekly newspapers to The Wall Street Journal, CNN and NPR — while avoiding the mass marketing approach most public relations firms use at the expense of reporters’ patience and clients’ credibility. Check out the depth and reach of our placements for our clients. All law firms have positive news to share — lateral hires, big wins, office moves, etc. — but making that news resonate with the press can be a challenge. The key is to cut through the clutter with a good story or a trend that’s timely that captures the firm’s messages. Whether lawyers are talking about the breaking news of the day, lateral hires, regulatory changes, case wins, transactions, or office moves, the news media is by far the most effective communication vehicle for getting in front of key client audiences. Increased credibility and visibility give lawyers and their firms a greater SEO (Search Engine Optimization) presence on the internet and motivates the media to use them again and again. The impact is invaluable to client development and recruiting. It outranks advertising for return on investment of marketing dollars. Thought leaders are in constant demand for their analysis, opinion, insights, and services. Click here for examples of Law Firm Media Placements. Are you interested in having your attorney’s become thought leaders in the media? Then contact us today to start a conversation with one of The SolutionPR’s principals.